The nofdp IDSS (Nature Oriented Flood Damage Prevention, Information and Decision Support System) is an open source application for the interactive development of flood risk strategies and 1D hydrodynamic flood simulation. 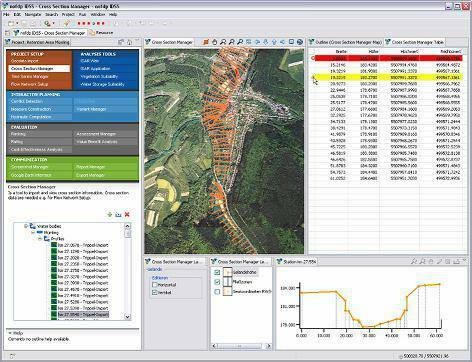 Additional modules for ecological and spatial analysis, multicriteria evaluation, flood risk maps, flood frequency, flood duration and communication are included. The acronym IDSS stands for Information and Decision Support System. The IDSS supports decision makers in the field of water management by providing relevant data and information in an interactive planning process of flood control measures, particularly in the stage of preliminary planning and strategy development. This software is the joint deliverable of the INTERREG III B project nofdp involving ten partners and engineering consultants from The Netherlands and Germany covering a broad range of expertise from different disciplines. * nofdp IDSS download link provides gnu general public license version of the software. RocSupport is a fast and easy to use program for estimating the deformation of circular tunnels in weak rock and visualizing the tunnel interaction with various support systems. No one has rated nofdp IDSS yet. Be the first to rate this product.